What is diverticulosis of the colon how to treat it? 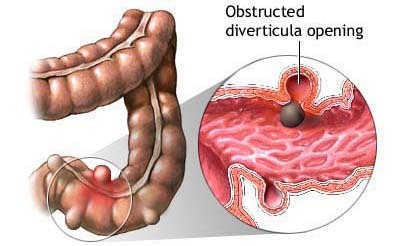 Diverticulosis of the colon or diverticular disease of the colon rarely occurs before the age of 40, and most often affects people over 65 years of age. It occurs as a result of food insecurity, with people who mostly eat food that is industrially processed food, and have long-standing problems with constipation. Foods rich in fibre in most cases ensure the formation of large and soft stools that move easily through the intestines. On the other hand, people whose daily menu is abundant in processed foods often have a problem with constipation - their stool is hard, more is retained in the body, which means that the colon strains a lot to put it out. On this occasion, it creates pressure on the more fragile parts of its walls and forms diverticula on its mucous membranes that is "pockets" filled with leftovers. This phenomenon is known as diverticulosis of the colon, and we will deal with it in this article. Diverticulosis of the colon is usually the result of obesity and chronic constipation that lasts several years back. It is believed that administration of constipation caused by lack of fibre in the diet is a major trigger for the development of diverticulosis, but it can be affected by lack of physical activity and obesity. However, the exact causes of the disease is not yet fully known. The formation of pockets on the lining of the colon in 80 percent of cases, is not accompanied by any symptoms of diverticulosis. Very few people feel bloating accompanied by gas and irregular bowel movement, provided that such problems are characteristic for irritable bowel syndrome, which may be associated with this disease. More specific symptoms occur if there is inflammation of pockets that is when there is a diverticulitis. This is why diverticulosis of the colon can be for a long time "masked" and it takes years to be discovered. If you are previously you had inflammation or infection, it is easier to diagnose it, because the manifestations of the disease is more easily visible. Then occurs intense abdominal pain on the left side and at the bottom, frequent fever, gas, bloating, nausea, vomiting, also diarrhoea and constipation. Often those suffering from diverticulosis feel exhausted, have less appetite and are visibly tired, so after going to the doctor patients discover they stand when they are diagnosed. Inflammation of the colon is usually accompanied by pain in the left side of the stomach and vomiting, while somewhat less frequently occurs fever. If baggy expansion cracks it may cause bacterial infection, and bleeding from diverticulum resulting in the appearance of blood in the stool, but it is almost never in large quantities. Due to the rare complications, diverticulosis of the colon is often discovered during routine screening of the colon, which should annually be done to all people older than 50 years, with the aim of prevention and early diagnosis of colorectal cancer. If you detect diverticulosis of the colon, which does not manifests any symptoms, recommended are lifestyle changes and proper diet. The menu should be rich in fibre, but not all at once, but gradually. Otherwise your body will do the so called disservice and cause bloating and gas. Fibre can be introduced into the diet, together with the liquid, which softens the stool - recommended are six to eight glasses of water a day, with mandatory physical activity, avoiding tobacco, alcohol, spicy and fatty foods, like soda and unhealthy meat products. Daily take one tablespoon of olive, flaxseed or walnut oil, to ensure that the body fatty acids that prevent inflammation and have an antimicrobial effect in dishes add garlic. Fresh fruits, especially kiwi, apples and plums, as well as vegetables such as cabbage, spinach, cauliflower and broccoli are the best source of valuable fibre, so it is recommended that the daily menu is has these foods and fresh squeezed juices. Legumes, nuts and fatty fish are also recommended, as well as potatoes, but only with the choir, if already diagnosed with diverticulosis of the colon. For breakfast you should eat grains, but not with milk - they are best combined with dried fruit or pumpkin seeds, flax or sesame seeds. Bread from whole grains is a good substitute for a refined flour, which should be removed from use, and recommended is wheat bran also, but they should not be eaten by people allergic or intolerant to gluten. Fresh fruits and vegetables, whole grains and pumpkin seeds, sesame and flax are the best allies in the fight against "pockets" on the lining of the colon. In a saucepan pour 6 cups of water. Once it boils, add one cup of lenses and cook for about half an hour. Meanwhile, on 1 spoon of olive oil 3/4 cup of chopped carrots, 1/3 cup leeks and 1/3 cup chopped celery fry on it. Add 1/4 cup of chopped almonds, 1 teaspoon of chopped thyme, 1/2 teaspoon of salt and 1/4 teaspoon of black pepper. Simmer until the almonds darken. Throw it all together in a blender, along with lentils, and mix until you have a coarse paste. Add the egg yolk and 1 tablespoon of lemon juice. Stir well and leave in the refrigerator for 1 hour. From the mixture make balls or burgers and fry them in olive oil. Add to blender 2 chopped avocados, 2 chopped cucumbers, 2 cups of spinach leaves, 1 cup of broth of vegetables, 1 chopped onion. 1 tablespoon of lemon juice, 1 tablespoon of balsamic vinegar, 3/4 cup of yogurt, 1 tablespoon of chopped mint and 1/2 a tablespoons of sea salt. Mix well to equalize the mixture, and serve sprinkled with mint. Halve three apples, remove the core and put them in a baking dish. Spread evenly the mixture of 6 tablespoons of chopped walnuts, 1/2 a tablespoon of cinnamon, 2 tablespoons of nutmeg and 1 tablespoon of brown sugar. Then pour a mixture of 1/4 cup of apple juice, ¼ cup of cold water and 2 tablespoons of almond oil. On each half add some honey and bake for 50 minutes at 180 ° C.
What are the experiences with diverticulosis – confessions of readers? The reader Stefan S. fully conveys his experience with the disease. Last year I went to a regular screening for colon cancer, the doctor discovered that there are on its walls pockets. He asked me how I eat, and when I said that I like bacon, sausages and ham, and I'm not a fan of fruits and vegetables, he told me that I'm lucky that I have not been affected with a lot more serious inflammation and more complications. Then the doctor explained that for diverticulosis, which does not causes problems changes in diet and lifestyle are crucial. I started to walk around the nearby park, each day a little, in the morning and evening – and I was reluctant to admit that I had never had a passion for physical activity and that only activity I did was play chess with my friends. I asked my wife to start cooking the beans without meat, which we had not been among my favourite dishes, but with every meal itself, albeit unwillingly, I ate a salad of fresh vegetables. I am no longer skipping breakfast - in the morning I eat fresh fruits or oat bran or cereal with dried fruit and flax seeds and between meals I nibble on nuts. I bought a juicer and my wife and I began to drink freshly squeezed juices of oranges or apples instead of purchased ones. I did not know what fibre in food was, or why they are important, but now I know my own faults. Otherwise, in the meantime, I was able to quit smoking, which was my inseparable habit in recent decades, concluded Stefan who is 64 years, and now he feels better than ever. We hope that you found out what is diverticulosis of the colon, and how you need a healthy diet to keep the disease under control, in order to be completely cured.